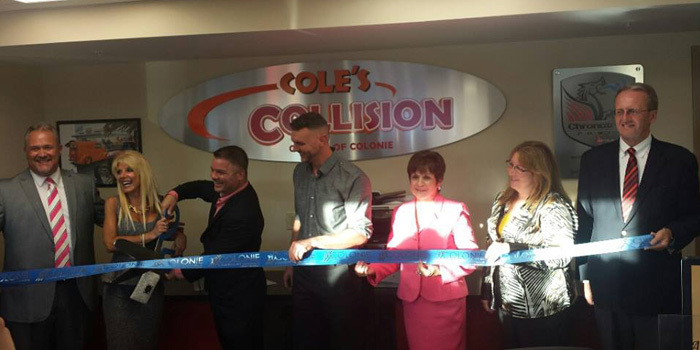 Cole’s Collision Centers has opened its fifth, and largest, service center located in Colonie, N.Y. Construction began in the spring on the 18,000-square-foot facility, formerly the Northway Inn. The new location is in addition to another nearby Cole’s center. This new shop features some of the most advanced auto repair equipment, including a custom, two-car USI Italia spraybooth. It also includes room to house more than 30 cars, features a showroom and training center, and is home to Cole’s management and insurance offices. Cole’s hired more than 15 new employees to staff the new location, from mechanical technicians and journeymen to clerical staff and customer service representatives. The company employs around 100 people between its five locations. The facility was officially unveiled at an open house and ribbon-cutting celebration on Sept. 24th at which Cole’s representatives presented a $5,000 donation to their charity partner, Ronald McDonald House Charities of the Capital Region. Colonie Chamber of Commerce officials and local elected officials were also on hand.